This lovely box holds four different Scottish teas - ten individually wrapped tea bags for each blend of Thistle, Heather, Whisky and Scottish Breakfast Tea. What a wonderful gift! Edinburgh Tea and Coffee Company was formed as a management buy-out in 1991. Since then, Edinburgh Tea and Coffee has progressed from a small local roaster to a modern coffee company having moved into new larger premises which were fitted out to a tailor made specification. Today they offer the same traditional quality of teas and coffees (including some new exciting products!) from a completely modern environment.Their new facility includes a purpose built tasting and training facility where their expert taster is delighted to taste our coffees and teas with our customers. You are welcome to visit their facility and have a cuppa! I gave these as gifts last year and my family couldn't get enough and bragged all year about how good the tea was! This tea selection is a great pick and for a good price. To be honest, I am extremely picky about the tea that I drink. This tea is well made and great flavor. Also, for not being big on Breakfast Tea, I love this one! The breakfast tea and the whisky one are my favorites. I look forward to purchasing more once I finish the box I just got! This tea is at great price and has a great selection! Highly suggested! This Scottish tea was so tasty that I couldn't decide a favorite. I'm still aligned to the fact that the "heather" flower is the origin of the female name. We are really enjoying the tea selection. The ordering and shipping were easy and all arrived quickly. Great idea for work. Enjoy this with your coworkers and friends. 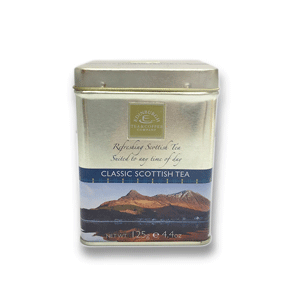 I fell in love with this tea when I went to Scotland and I am so glad that I can keep a supply on hand with your help. It is wonderful tea!! Thank you for all the wonderful products that you carry. A great selection in a pretty box. The teas are richer and more complex than the ones I usually drink, so I put away my mugs and bring out the fine china cups to have my own little tea party.